Hey Brother Can You Spare $700,000? <em>Captured on Film:</em> Randall Van Wolfswinkel-secretive and mysterious-emerged as the 700,000-dollar gorilla in one of the most contentious elections in city history. Notoriously media-averse, Van Wolfswinkel declined all but one request for interviews. 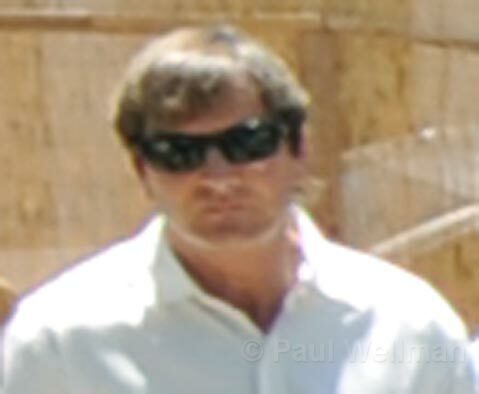 Still, <em>Independent</em> photographer Paul Wellman managed to catch the elusive Texas housing developer at a rally for Dale Francisco. As of 7 p.m. Monday, the number of voters casting ballots in this year’s all-mail Santa Barbara city elections had exceeded the number of those who voted in 2007. According to Marcelo Lopez, assistant city administrator, city elections officials had received 17,700 ballots by day’s end Monday; that contrasts with the total 16,363 received in 2007. Voters still have until 8 p.m. Tuesday to get their ballots into City Hall (located on De la Guerra Plaza) or one of six drop-off points throughout the city. Votes received after 8 p.m. will not be accepted nor will they be counted. Accordingly, last-minute voters are strongly advised not to put their mail-in ballots in the mail at this time, but to walk their ballots in. For more information, call 564-5309. More election day info, including drop-off spots, can also be found here. Up for grabs is just about everything. Not only is the mayor’s seat the focus of a heated contest between five candidates, but there are 13 candidates chasing three spots on the City Council. Of those, only one – Grant House – is an incumbent. But it’s highly likely that a fourth council spot will come into play if either mayoral candidate Dale Francisco or Helene Schneider – both sitting council members – should prevail. In addition, voters are being asked in the form of Measure B whether they want to amend the city’s constitution to lower the maximum allowable building height from 60 feet to 40 in El Pueblo Viejo and to 45 feet elsewhere throughout the city. If the council is up for grabs, there’s been no shortage of power-grabbers entering the fray. Randall Van Wolfswinkel, the Santa Barbara-born Texas housing developer, has spent close to $700,000 of his own money backing a conservative slate of Dale Francisco for mayor; Frank Hotchkiss, Michael Self, and Cathie McCammon for City Council; and Yes on Measure B. His spending has dwarfed the considerable donations made by the public employee unions. Combined, these unions have raised and spent in excess of $150,000 on behalf of their candidates. The unions were far from unified as to which candidates they supported. City elections officials estimate they’ll have the first major tally of votes by 8:15 p.m. this evening. Those who can’t be at City Hall can tune in to Channel 18 for results or access the city’s Web site, sbcityvote.org. That will not be the final vote, but a large percentage is expected to have come in by then. It remains unclear how long it will take to process, verify the signatures, and count the remaining ballots. Provisional ballots will be counted several days from now. Thus far, only a few provisional ballots have been cast. City officials say that roughly 150 ballots already cast remain uncertain because the voters either failed to sign the ballots or the signatures do not match the signature shown on the individuals’ voter registration forms. City officials say they’ve been attempting to contact these individuals by phone and by mail. No changes to new signatures will be accepted after 8 p.m.
An unknown number of ballots were not successfully delivered, either because the individuals had moved or because mail carriers did not deliver the large ballot envelopes into the small mailboxes found at many apartment houses. These ballots were returned to the main post office in Goleta where they were shredded. City officials have no record of how many such ballots were shredded. In the meantime, voters who want to meet-and-greet the candidates on election night have no shortage of party spots to choose from. Mayoral candidate Helene Schneider will be having her party at Dargan’s along with council candidates Harwood “Bendy” White and Dianne Channing. Mayoral candidate Dale Francisco and his supporters will be gathering at Joe’s, and his slatemates Michael Self and Frank Hotchkiss will be Left at Albuquerque. Mayoral contender Steve Cushman will be at the Arts and Letters Cafe, councilmember and candidate Grant House will be at State & A, David Pritchett at Jill’s, and the No on B crowd at the Paradise.